Bet 365 is one of the best on the net! Bet365 is one of the best known and iconic names in the UK online gaming world. It gives members a top class gaming experience therefore, it is no surprise that this site is the top choice for thousands and thousands of casino players. Powered largely by Playtech software, there are also many games featured that are supplied by other big names in the industry such as NetEnt and Microgaming. Bet365 offers in our opinion some of the top games in the business, and as such we highly recommend this online casino and believe wholeheartedly that it should be on every online gamer’s list of favourite sites to play. The main thing players look out for are the available games and Bet365 has an amazing selection. There are slots of every variety, as well as video poker, casino classics like baccarat and blackjack, roulette, scratch cards, keno, and a whole range of jackpot games all included on the extensive games list. There is something for everyone, no matter what they like to play. One of the best things about the Bet365 Casino is that it’s also available on mobile. No more waiting to get home to play – you can now play your favourite site from anywhere as long as you have your smart phone or tablet with you. Just log in using your regular alias and password, either on your Android or Apple device and you will be ready to play – no need to download; it’s also available on other compatible mobiles and tablets too. The Bet365 website is a classic green and black one that is easy on the eye and is easy to navigate. The layout is simple with conveniently placed tabs to take you to the different sections straight from the homepage. Short cuts to the new games and the more popular games are all just a click away. There is also a short cut to the Live Dealers at the top right corner and you can scroll down to see a detailed list of all the games featured which are conveniently and neatly sorted by categories. Important tabs are lined up on the left of the screen with the Featured Games tab at the top. Here you will find new additions and a mix of the most popular games. The remaining tabs are named according to game categories and you can choose from Slots, Card games, Table games, Video Poker, other Games & Keno, and the Jackpots. The Live Casino, as its name suggests, has eight rooms hosted by live dealers. There are European and Asian dealers and the games include Baccarat, Blackjack, Casino Hold Em, and more. For new players in the UK there is currently an exclusive Opening Bonus of 100% on a first qualifying deposit of a minimum of £10 up to a maximum of £100. Aside from the Standard Opening Bonus there are two other bonuses to choose from: A slots only opening bonus, which comprises of a big 200% up to £200. Not only can slots fans receive this bonus, but once they become members of the Slot Club they can receive further benefits by earning comp points by just opting in on the special promotions page. The third bonus to choose from is a Special VIP opening bonus, which comprises of a 50% bonus up to £500. For the standard opening bonus play through requirements are 20x deposit and bonus and for the slot and VIP bonuses, play through requirements are 30x deposit and bonus amount. 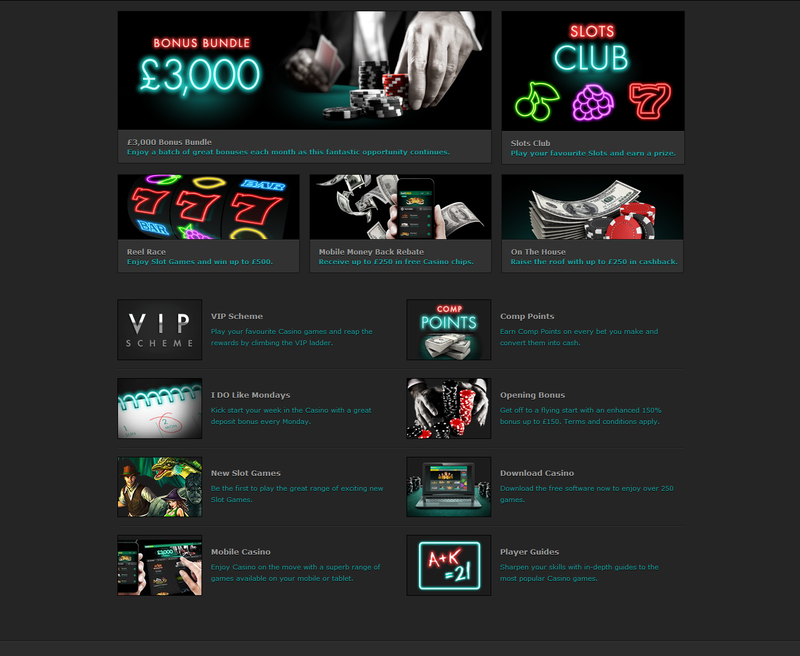 If you are a high roller then the VIP Scheme at Bet365 will be of interest. There are four levels and each level has attractive benefits. The more you play the faster you climb up the levels and receive more attractive benefits. Start at Bronze and work your way up through Silver, Gold and finally to the Diamond level. Benefits include Deposit Bonus codes, access to exclusive weekly bonus offers, free Casino chips, better Comp Point conversion rates and other special promotions. It goes without saying that the best offers are in the top two levels where members get VIP Account Managers and invites to big sporting events with first class hospitality thrown in, this is amongst other benefits. 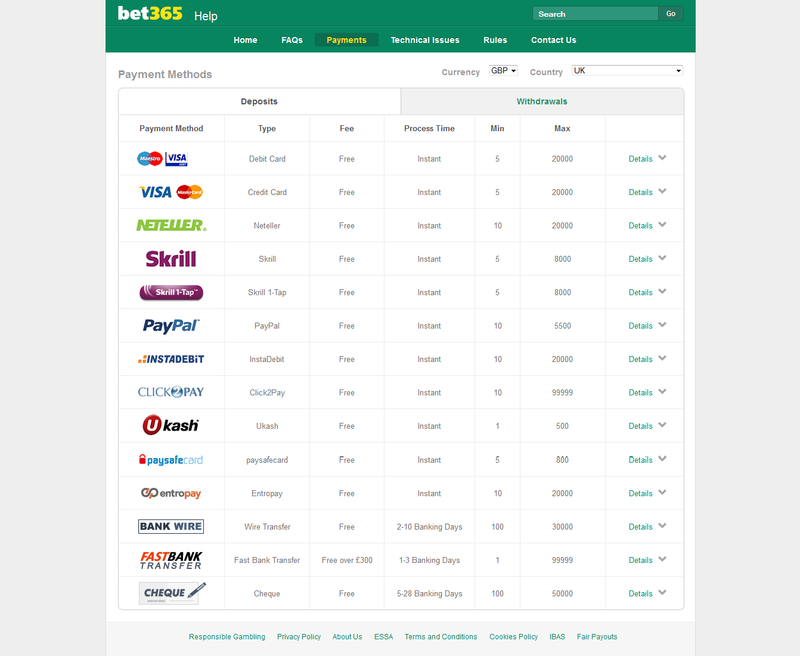 Bet365 has a very wide selection of banking/payment options; in fact it is very simple to make deposits and withdrawals here. 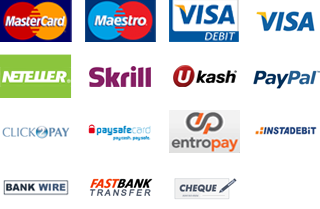 Methods include Credit card and Debit Card, Neteller, Instadebit, Skrill, PayPal, Ukash, Paysafecard, Entropay, Click2pay, Bank transfer, Wire transfer and Cheque. Customer Service can be contacted via telephone, email, chat, fax and via post. The live chat is perfect for quick answers to simple queries. Please visit our casino reviews page to find out about all the other casinos. How do you rate Bet365 Online Casino? Enjoy an incredible 100% up to £100 for all new players! A slots only bonus - 200% up to £200. VIP bonus - 50% up to £500. The VIP Scheme has four levels – Bronze, Silver, Gold, and Diamond. Benefits improve with every ascending level. Comp Points are earned on every wager and can be converted to cash. Conversion rates improve according to the VIP level. Claim Deposit Bonuses every Monday. Claim more bonuses in the £3,000 Bonus Bundle four times a week.